Litton Agri-Science Learning Center featured in "Missouri Today"
Chillicothe High School's unique agriculture campus - the Litton Agri-Science Learning Center - constructed more than 20 years ago, continues to accommodate growing interest in agriculture and is featured in the latest edition of Missouri Farmer Today. The publication serves more than 18,000 farm operations throughout the state according to the company's website. 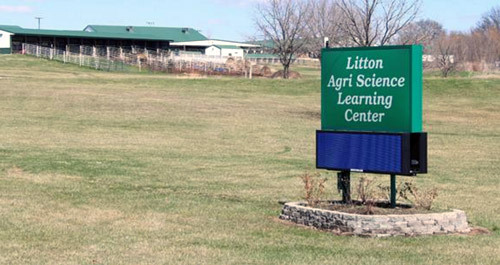 The Litton ag center is a 36-acre complex northwest of Chillicothe and includes classrooms, a community center, a livestock arena, fairgrounds and places for housing animals. About 65 pigs, as well as some cattle, sheep and goats are kept at the center. Ag instructor Randy Plattner is quoted in the article stating that he thinks the ag campus is one of the best facilities in the Midwest. The school broke ground at the site in 1993 and the facility opened in 1994. Some of the students now enrolled in the ag program have parents who were among the first to keep animals at the center. The campus has continued to grow since the early 1990s. The ag education building was completed in 2010 and the fairground building in 2012. Chillicothe has 223 students enrolled in agriculture education courses according to FFA adviser Leda Schreiner. The article stated that in 2014, Chillicothe's ag students and FFA members contributed more than $539,000 to the local economy through their supervised agricultural experience projects. The article included background information about the Litton Center, recapping how the Jerry Litton Memorial Family Foundation provided a grant to fund the center. Litton owned a Charolais ranch at Chillicothe. He was a congressman in the 1970s and died in a plane crash in 1976 on the night he won the Democratic primary election in the U.S. Senate race. Freshman ag students watch two videos about Jerry Litton and spend a day talking about his life and legacy, ag instructor Lance Martin told Missouri Farmer Today.